Wow! Now that's a major announcement.! Criterion has the rights to this as well but I'm not holding my breath for them to put it out. Nice one! I shall be getting that. An absolutely magnificent film. I flagged the restoration up to Arrow when it was premiered, but in truth it was always more of a Second Run title - it's a bit too obscure to risk a full-on dual-format release. But you can blind-buy this one with complete confidence: it's one of the very best Czech films of the Sixties, which is saying something. I'm not gonna wait for Criterion to release this masterpiece, and will instead buy it day one. Absolutely fantastic news. I own the Facets dvd, and while they did their level best to ruin the film, All My Good Countrymen is so beautiful and poignant that even Facets couldn't ruin it entirely. It'll be great to have a release from a company that does it right. For folks who haven't seen it, this release is totally worth a blind-buy. Going "wow!" at a new Second Run cover is pretty much my default mode, but... wow! I'm particularly impressed because this film is such a hard sell - it's a great, great film, but you really don't get that from a synopsis that makes it seem the epitome of the worthy but dull. Trying to lure in the Pat O'Neill crowd I see. The still on the Second Run website (accessed through the link in the first post) makes the film look as if it may have been visually influential on both Terrence Malick and the Bill Douglas of Comrades, although that's probably not likely given its suppression. If it's anything close to the calibre of the recent, fantastic run of Czechoslovak films Second Run have released (particularly Dragon's Return and Pictures of the Old World), it'll be a great addition to the collection. 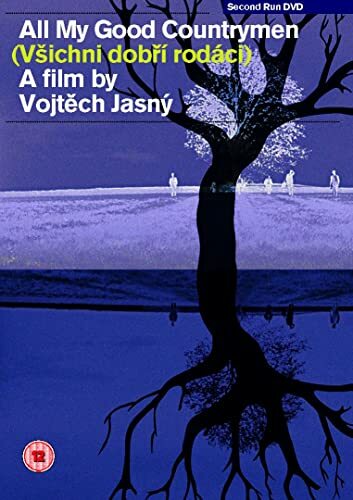 Well, put it like this: in the famous 1998 Czech/Slovak critics' poll that voted Marketa Lazarova their national masterpiece, All My Good Countrymen came third. And the first three entries were some distance ahead of the rest. Celebrating Vojtěch Jasný’s 90th birthday and lifetime achievements, the annual Made in Prague Czech Film Festival pays tribute to this great filmmaker, hailed as "the spiritual father of the Czech New Wave" by Miloš Forman. It's out on English-friendly DVD in the Czech Republic if you can't. MichaelB wrote: It's out on English-friendly DVD in the Czech Republic if you can't. Brilliant! Do you have a link? Is Jasny's 'Desire' available anywhere too? Both my former Czech suppliers seem to have gone out of business, but DVD Best in Slovakia (whose packaging would stop a tank) has it for €6.95. And there's more good news too - although don't be tempted by the Czech disc of All My Good Countrymen: not only is it not the new restoration that Second Run is using but it definitely doesn't have English subtitles. MichaelB wrote: Both my former Czech suppliers seem to have gone out of business, but DVD Best in Slovakia (whose packaging would stop a tank) has it for €6.95. Great, thanks for that. Very reasonably priced. I'll have a look around for some other things too. Full details on this release now up at the Second Run website and available to order. Any chance this getting a Blu-ray as well? "A bawdy, vital film... a whole mini-series worth of story packed into just short of two hours... there is just so much in here"